The pod plug combines the advantages of a roll-down foam earplug with those of a pre-moulded one and adds some features of its own. 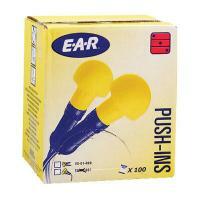 The minimal amount of foam reduces pressure in the ear to improve comfort. There is less sound distortion which improves communication. No rolling or touching is required for insertion or removal which eliminates fear of contamination. The plug is easily inserted and can, for example, be inserted whilst wearing gloves. The fit is immediate, there is no waiting while the foam expands.